Hillsdale has, in fact, had mul­tiple foun­tains on campus through the decades — including one that stu­dents blew up with dynamite in a prank gone wildly awry. 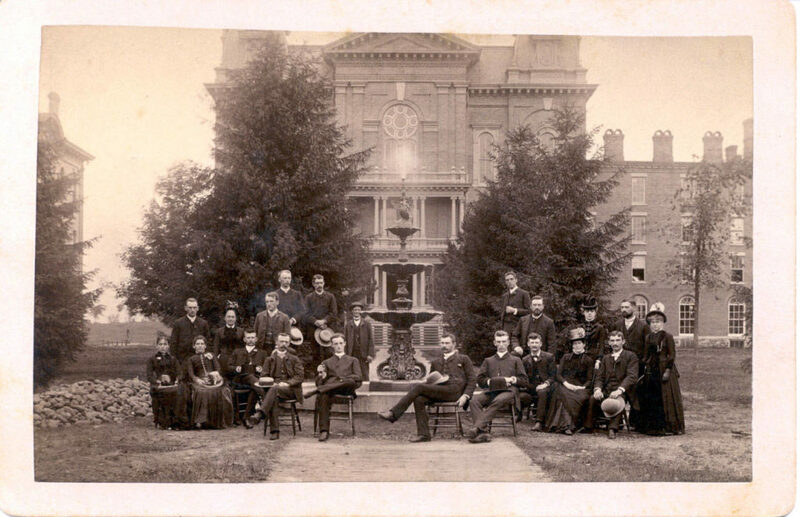 The total cost for the fountain in 1886 was around $300, a total that the seniors could not raise on their own. However, the college and many towns­people donated in order to see the fountain come to actu­ality. In the Dec. 9, 1971 edition of the Col­legian, one article men­tioned that stu­dents had used a pipe system to get running water from Baw Beese Lake for the fountain. The water sprayed out of the mouth of a stone goose, which was held by a little stone boy. 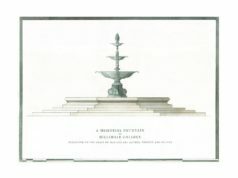 The old fountain was orig­i­nally placed in front of Central Hall, a pic­turesque setting that was the shot for many Hillsdale College post­cards in the early 20th century. That fountain was moved to another location on the edge of campus two years later, however, largely due to com­plaints from stu­dents who were getting wet. There was a walkway on either side of the fountain, and depending which way the wind blew on a given day, stu­dents would be soaked by the water spraying from the fountain. Despite the epigram “No Effort Lost” inscribed at its base, the college ceased efforts to keep the fountain running around the time of the first World War. On April 18th, 1918, a reporter for the Col­legian com­plained that the fountain had not been running since the fall of 1916. It was not until another year passed when the fountain was restored. In May of 1919, a janitor by the last name of Van Patten decided to clean out, refill, and repaint the fountain. The fountain con­tained rich, comical stories while it lasted. For example, upper­classmen would throw freshmen in the fountain as a means of hazing. Another time, a boy was fully immersed in the fountain on accident — he fell into the basin at the ded­i­cation of the Alpha Kappa Phi Civil War mon­ument. The fountain remained standing on campus until April of 1940, when unknown vandals destroyed it with a stick of dynamite. A fuse was found in the damage, but the cul­prits were never caught. “People always gave me the impression, when they talked about it, that they figured they knew who did it, but nobody was ever arrested,” Mossey Library employee Linda Moore said. But that was not Hillsdale’s only campus fountain. In 1992, the senior class pro­posed to build another fountain. The class achieved this goal but only with great financial help from the Student Fed­er­ation. As seen in The Col­legian articles from that time, several stu­dents resented the decision to allocate student fees for the fountain, espe­cially because the class of 1992 was only planning to cover about $1,000 of the pro­posed $8,000 cost. Nev­er­theless, after a lot of time, funds, and labor, the new fountain was built. It was also repaired mul­tiple times within the first year fol­lowing damage from student pranks. A few years ago marked the most recent episode in the campus fountain saga. According to Moore, it was dis­covered that a city res­ident had picked up a few pieces of the first fountain years after the dynamite incident, and someone later returned them to the college. But due to the pro­jected costs, the college could not restore the piece, and it remains some­where within the Fowler Main­te­nance building.